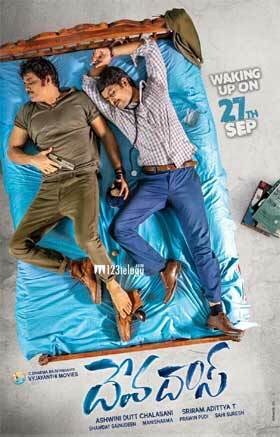 The much-awaited first look of Nagarjuna and Nani’s Devadas was released today and the first impression that we get from the poster is that the film is going to be quite a hilarious and fun ride. Both Nani and Nag are seen passed out in the poster which has now gone viral. This is the first time that Nani is acting with a star hero like Nagarjuna. There is a lot of expectation on this project and this first look has surely increased the hype for the film. Sriram Aditya directs this film which has been produced by Vyjayanthi Movies and is up for a September 27th release.